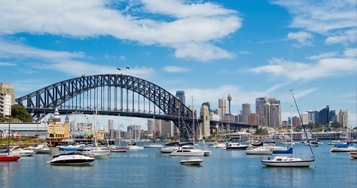 From Sydney, drive 1 ½ hours' drive north along the Pacific Highway to the Central Coast. Explore the region's fabulous beaches and waterways en route, then head inland toward Cessnock to sample the delights of the Hunter Valley. There are numerous boutique and well-known wineries with cellar door tastings and sales. Fresh local produce is served at several excellent winery restaurants along the way. 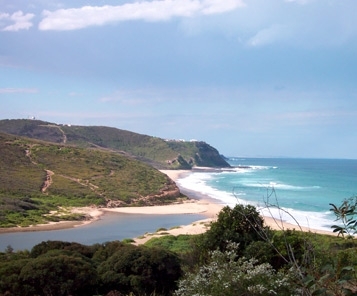 Take the scenic drive via Port Stephens' beautiful beaches and bays. Head north to Forster and the clear water of Myall, Smiths and Wallis Lakes, home to pelicans, sea eagles, kangaroos and koalas. 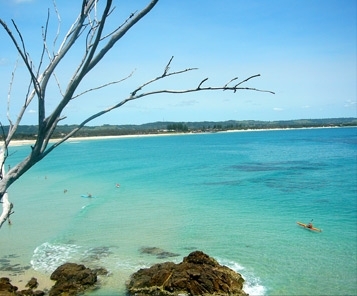 Port Macquarie has one of the best climates in Australia, with water temperature of 22 degress Celsius, even in winter! There are 13 golden beaches, National Parks, spectacular mountain and river scenery and a long list of attractions to captivate you. On the way to Coffs Harbour, enjoy the coastal scenery, paddle in the waters of Trial Bay at South West Rocks or visit the Swiss Toymaker at Nambucca. Coffs Harbour is a bustling resort town and ideal family holiday location. There's a wonderful array of beaches, recreational facilities and Bonville International Golf & Country Club, which is modelled on Augusta in the USA. On the way to the Tweed Coast, enjoy the lush countryside and panoramic views. Drive to Ballina, a bustling community at the mouth of the Richmond River and home of Thursday Plantation (the original tea tree plantation), then on to Byron Bay, Australia's most easterly point, with its eclectic mix of cultures, superb beaches, great cafes and restaurants. 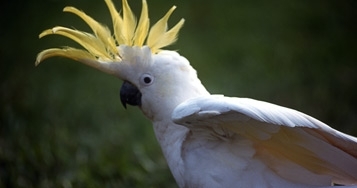 Drive along the Tweed Valley, a scenic drive through pretty villages, to Tweed Heads or Cabarita Beach. 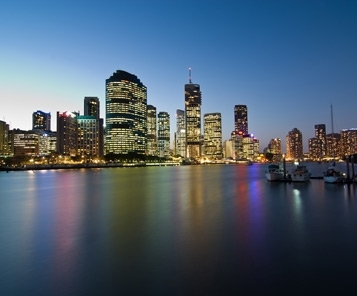 Brisbane is the capital of Queensland. This laid-back city is built on the banks of the Brisbane River and, with its wonderful weather, friendly people and plenty of attractions, it is an easy place to explore on foot. From Mt Coot-Tha, 8 kms from the city, you are afforded wonderful views over Brisbane and as far as Stradbroke Island and the Glass House Mountains. Take a City Cat ride along the Brisbane River or take a stroll around South Bank, one of the city's liveliest areas with a wildlife sanctuary, market stalls, restaurants and cafes, bike paths and a sandy beach. Head north past the spectacular Glass House Mountains to the Sunshine Coast, a low-rise, relaxed alternative to the Gold Coast. 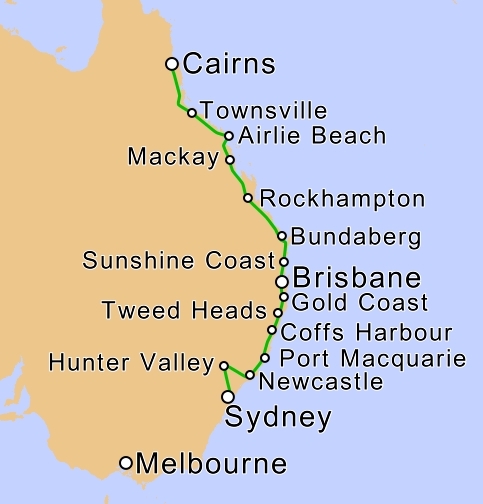 The coastline from Caloundra to Noosa Heads affords panoramic seascapes and has expansive beaches. The coastal resorts offer contemporary food prepared by some of Queensland's most accomplished restaurateurs, using local seafoods and produce. Noosa Heads is home to trendy boutiques and internationally-recognised haute couture, whilst locally produced crafts can be found in the markets of Caloundra and Mooloolaba. Continue sampling the delights of the Sunshine Coast today. In the afternoon head up to Hervey Bay - 'Whale Watch Capital of the World'. Enjoy the magnificent protected waterways and year round swimming or, between August & October, view the humpback whales. Bundaberg is the heart of Australia's sugar industry and home to the famous Bundaberg Rum. Take a guided tour of the Bundaberg Rum Distillery and enjoy a rum cocktail afterwards. Bundaberg is the southernmost access point to the Great Barrier Reef and Mon Repos Beach hosts the annual pilgrimage of giant sea turtles to lay their eggs in Queensland's largest turtle rookery. Travel north through Gladstone to Rockhampton, enjoying the coastline and hinterland sights along the way. Heron Island, a coral cay renowned for its unique marine life, is accessed from Gladstone. 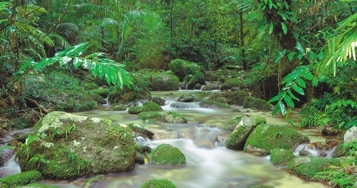 Explore the seaside villages of Yeppoon and Rosslyn Bay or visit one of the 15 National Parks, the wildlife parks or the Dreamtime Cultural Centre in Rockhampton. Turn off Highway 1 to take the Scenic Loop, which takes you to 13 of Queensland's most beautiful beaches between Yeppoon and Emu Park. Travel on through sugar cane fields to Sarina and Mackay. Mackay is amidst some of the most fertile plains of sugar cane plantations. Head north to take advantage of the spectacular Whitsunday's - lush, tropical, mountainous islands and bays set in clear blue waters on the fringe of the Great Barrier Reef. Cruise to some of the islands or take a seaplane or cruise out to Whitehaven Beach and the Great Barrier Reef. There are many trips to choose from departing from Airlie Beach or Shute Harbour. On your journey north you will travel through Bowen, home to Australia's best mangoes. Bowen has some pretty beaches and lookouts with views over the Whitsunday Islands and coastline. Head north to Townsville in time for a trip to nearby Magnetic Island. In Townsville, experience the relaxed charm of the tropics and indulge in the entertainment, dining and shopping this city has to offer.